Mr. Haas joined the PA/NJ community Boards in 2007, serving as their treasurer until 2011. During that period, he also served on the NSC Budget and Finance committee and the NSC. Investment & Treasury committee. In 2011, he became Board Chair of the two New Jersey communities, which lead to his appointment to the NSC Board in 2012. 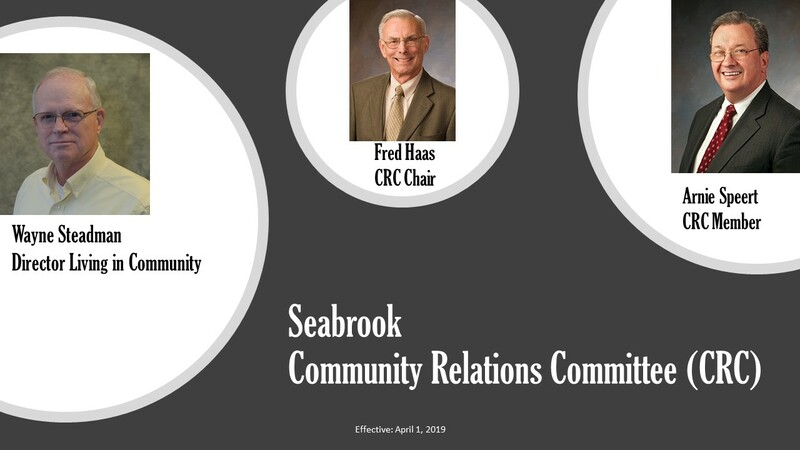 In 2015, he became Board Chair of the two Pennsylvania communities; in 2016 the two Massachusetts communities; and ultimately the seven community Northeast region, all of which Fred chaired until March of 2018. In his professional career, Fred was a tax partner at PricewaterhouseCoopers, from 1978 until 2001, when he retired. From 1972 until 1982, he served in various positions on the professional staff at Coopers & Lybrand. After graduating from Penn State with a degree in accounting in 1966, Fred served as an aircraft maintenance officer in the USAF until 1971. Mr. Steadman is the Director Living in the Community at Seabrook Village. He is a “Jersey Boy” having been born in Red Bank, raised in Middlesex and Ocean counties, and graduating from Stevens Institute of Technology in Hoboken with an undergraduate degree 1967 and graduate degree 1973 in Chemical Engineering. He worked for Mobil Oil Corporation (Mobil) from 1967 until 2000, retiring shortly after the merger with Exxon Corporation in 2000. Wayne’s corporate experience included senior positions in product development, international supply and distribution, International Technical Service, and Procurement After leaving Mobil, he obtained real estate agent and broker licenses in Savannah, GA. He was the president of a condo association in Savannah, GA for two years and in Asbury Park, NJ for five years. Mr. Steadman has extensive knowledge in long range planning, strategic sourcing, budget development, people motivation/management, and operations. Mr. Steadman enjoys an active life including pickle ball, ping pong, golf, gym/pool activities, and traveling with his wife, Pam.